I have a very very easy DIY for you today that will give you lots of new decorating options in your home. 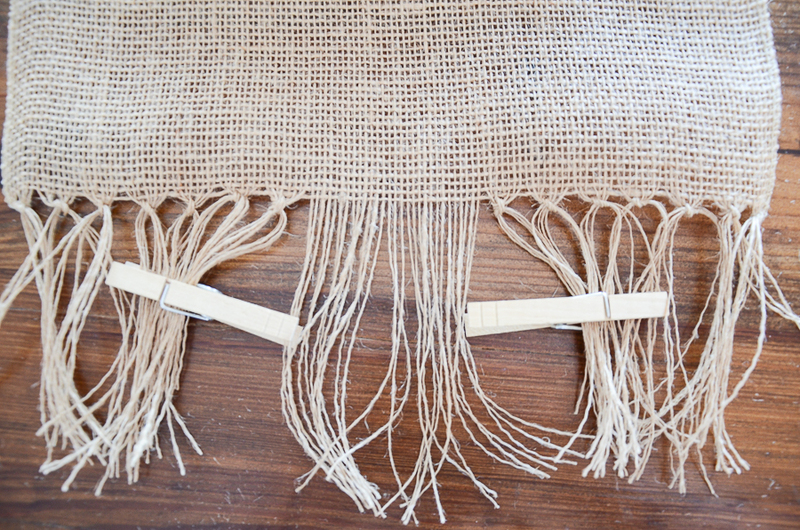 Today we are making the easiest-peasiest burlap runner with a wild and fun fringe! Even if you are not a fan of burlap you will love this runner because it is so textural and will go with any style. You can probably make this in under 30 minutes! 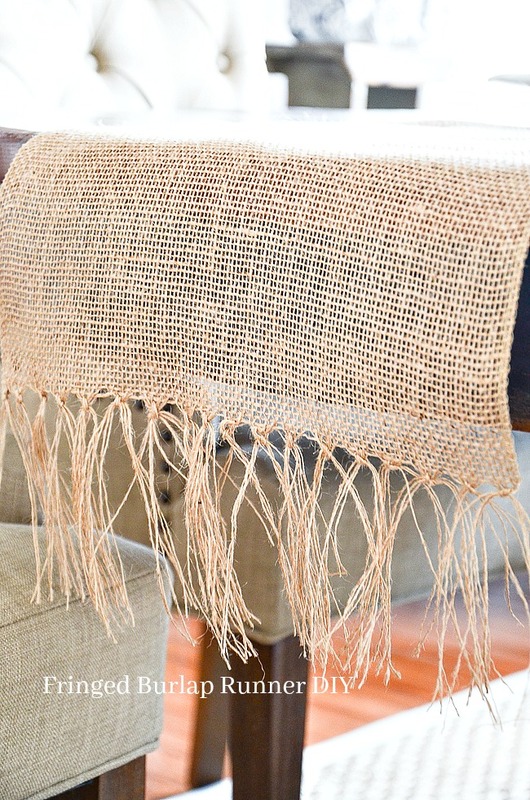 Let’s make a fringed burlap runner! You can get a roll of burlap in different widths and YOU can cut them and make a custom size table runner. 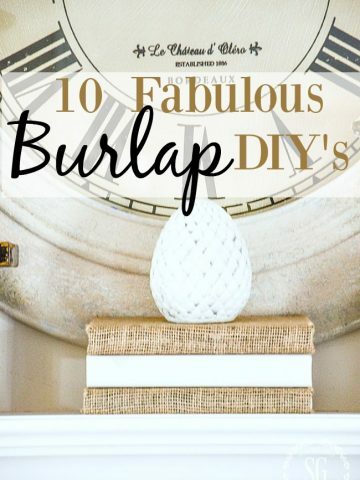 And these burlap rolls are so inexpensive! See a 12-inch width roll HERE. I think it’s the perfect width for a table. And see a 14-inch width HERE. Now just measure the length of your table and add the drop length on both sides. For my table, I used a 4-inch solid drop and a 5-inch fringe on each side. Because the fringe is a bit wild it needs about 5 inches to fall somewhat straight. So that is…. 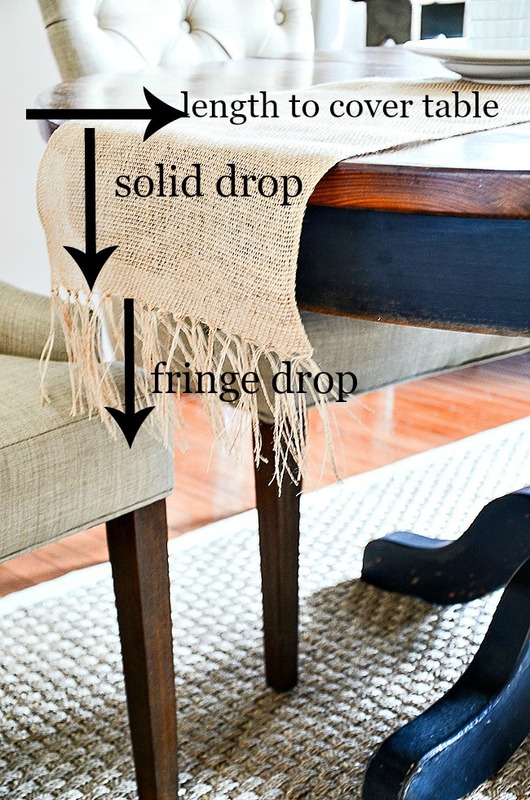 the length to cover the table + solid drop left side + solid drop right side + fringe drop left side + fringe drop right side! Pull the weft threads until a 5-inch fringe is made. 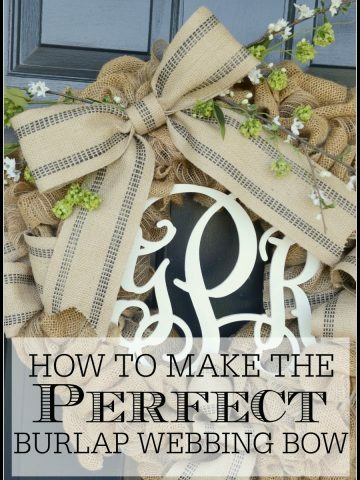 This is so easy because the weave of the burlap is loose. Starting at each end of the runner, tie 6 to 8 fringe strands into a knot. I used 4 stands in my left hand and 4 in my right to tie a square knot. Work on one side and then the other making knots until you get close to the middle. 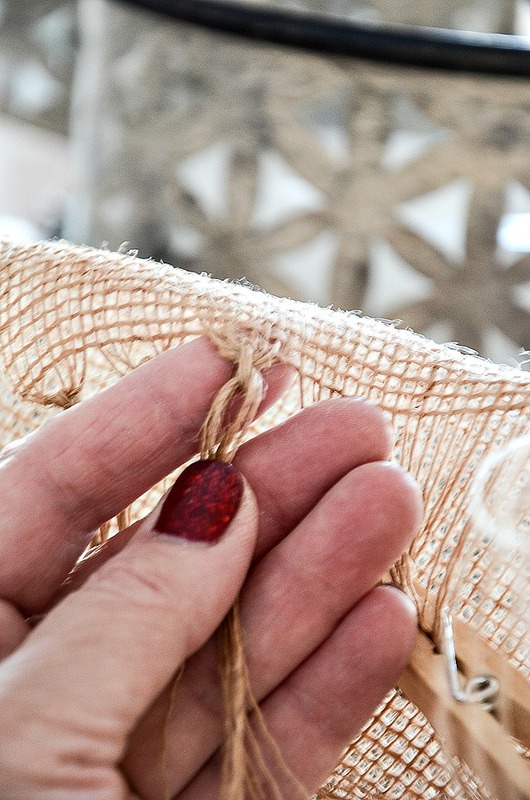 I made this project right before Christmas… hence the sparkly nail polish! When I got near the middle of the fringe I saw that the center knotted fringe would be thin so I made the center knots our of 7 strands. 4 in one hand and 3 in the other. This is a beautiful handmade item so don’t worry if a knot is made out of one or two fewer burlap strands. To help keep the fringe a little more easy to work with I used a couple clothespins to section off the burlap strands I was working on. The fringe is a little wild. You can leave it like that or iron it (no steam). If the fringe is longer in areas then others you can also trim it to be the same length. How easy is that!!!! 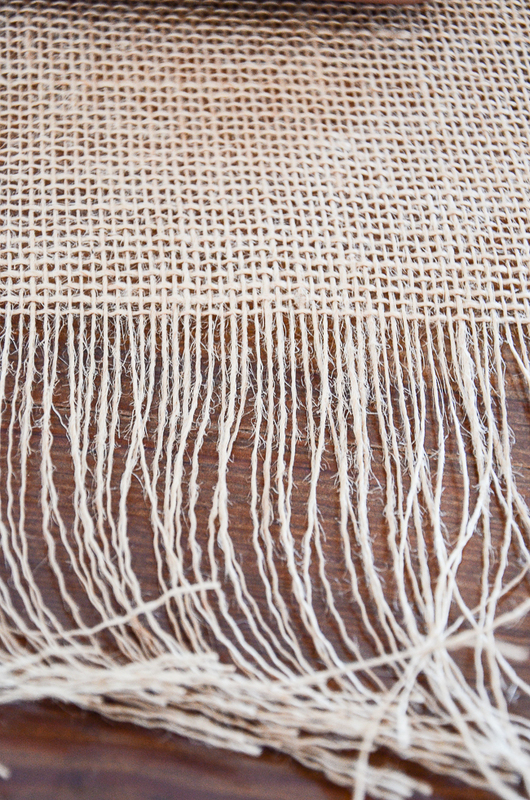 You can also use this technique on finer, more tightly woven burlap. But the look will be very different. 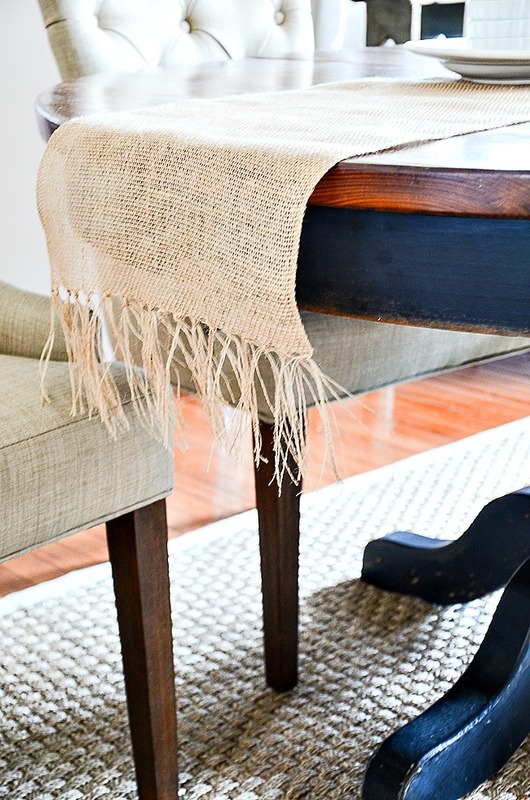 Now, no matter how long an island, table or any horizontal surface is you can put a gorgeous custom-made burlap runner on it! This is in regard to your recent menu posts where you are doing the copying of recipes differently. Also some recipes are linked to Pinterest. I don’t prefer this. Several were just not available, or the page was no loner there. I like the recipes you share! Can you make them more accessible for an old timer like me, please? I love this post, I will be making this tomorrow. Thank you so much for sharing. How do you keep the threads from fraying on the sides of the runner – not the ends, but the long sides that measures the length of your table? Great question Penny! 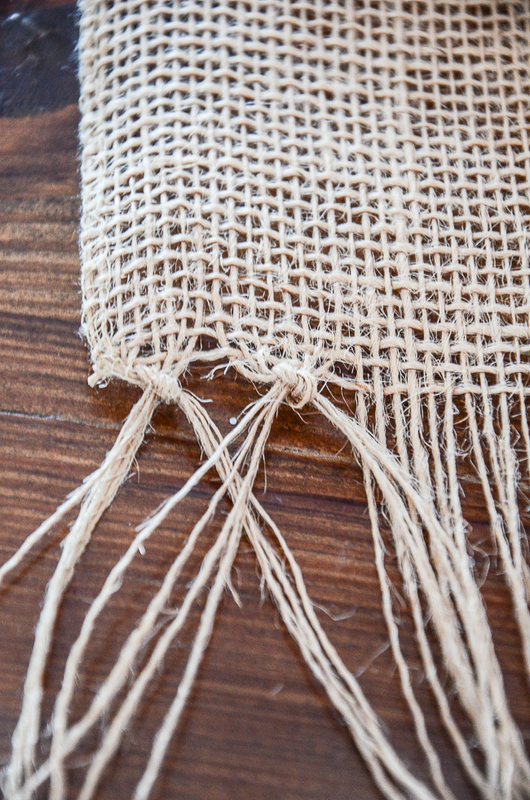 The ends of the burlap are bonded together. Gotta love the rolls of burlap! Cuteness! My only gripe with burlap is that once its dirty….its toast…..how do you clean it?? Fantastic, easy idea that I’m going to start now (I’m so ready for spring!). I love how you tied knots in the fringe. I have always left mine ravelled. Your genius continues to amaze me! Thanks for the brilliant ideas! And many prayers for your continued healing. great, easy to follow directions- thanks Yvonne! Great idea, thanks so much. Definitely am making one. As the other reader said, I did not know Amazon sold it in rolls. LOVELY! Thanks for the very clear and easy instructions. Yvonne,I like the texture look of the burlap. 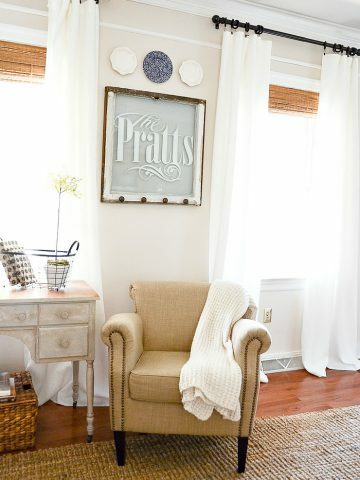 I’m wondering can the the burlap be bleached for a lighter look? This looks like a project that I want to make for my kitchen table. Thanks for the idea and have a great day. When I looked on Amazon there were white and other colors, if that helps you? Thanks so much for answering Karen! So amazing Yvonne. And so easy. Thank you!!! I love this table runner! I don’t sew – at all – so this is a perfect project for me! Thank you! Oh Yvonne you are so clever!! What a wonderful idea and so easy peasy!! That is a definite must do!! Thank you! FABULOUS idea! This is exactly what I needed for my dining room! 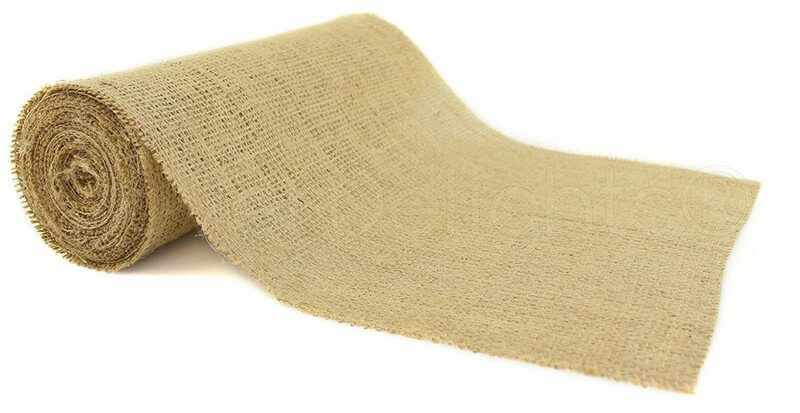 One question: do these burlap rolls come in different colors? I would need white, actually, rather than natural, as shown in your photos. Thanks very much! 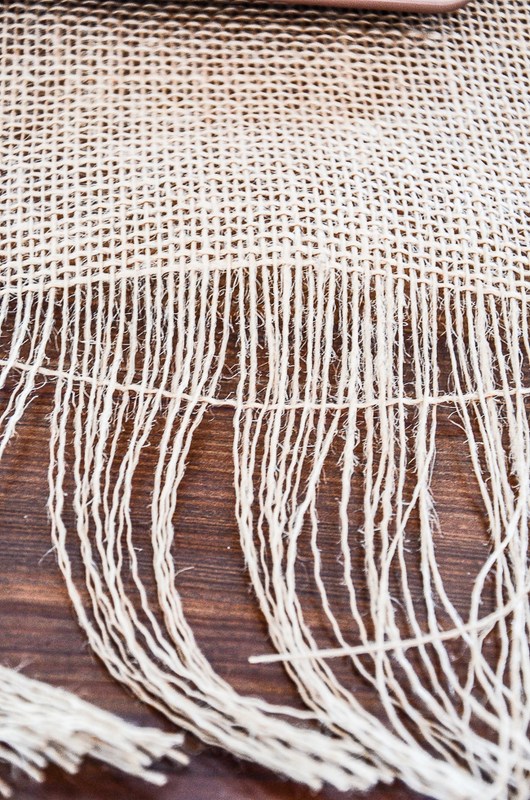 Do you need to wash the burlap prior to making the runner? Wow! What an easy way to add some texture. Thanks for the tutorial! Glad you like it Carrie! 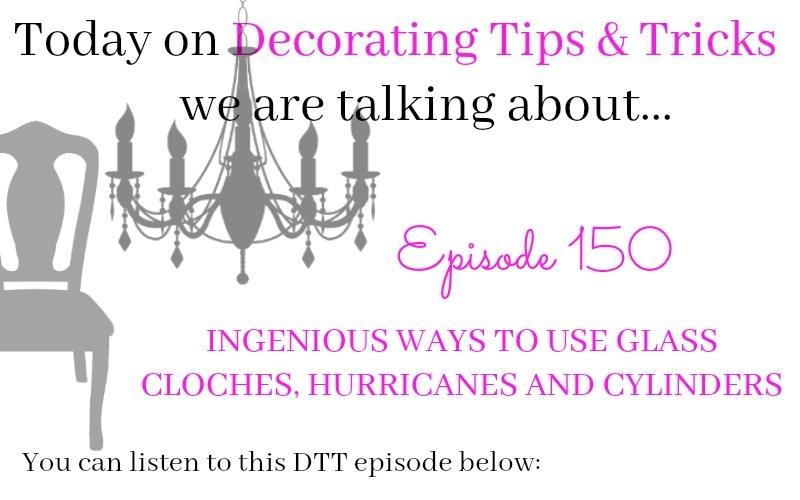 Perfect for a winter look adding some of the bleached pinecones that you have a tutorial on. Winter look without looking like left over Christmas. Will add a birds nest with one or two gray white ornamental birds I have and of course a candle re: ideas from Yvonne. really cute runner with fringe and it looks easy too! 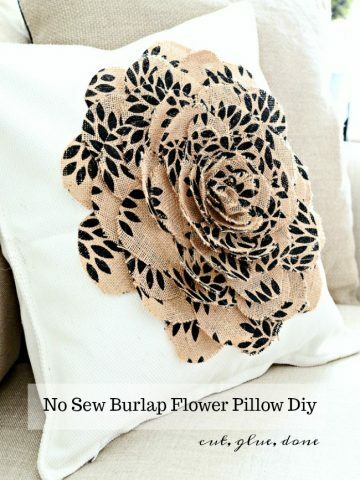 I have a roll of burlap in my attic and I will do this craft next snowy day. Thank you for this idea. I have never bought burlap from Amazon before. I didn’t realize that they had this width to use for a table runner. Now I will try this project for my table because it looks great. Thanks for the information.